Have you ever wondered what happens to the other half of the Winnipeg Jets and Manitoba Moose 50/50 funds? When you purchase a 50/50 ticket at Winnipeg Jets or Manitoba Moose home games, half of each pot goes to support the True North Youth Foundation, funding programming that benefits local youth in Manitoba. By purchasing a ticket, Winnipeg Jets and Manitoba Moose fans help make the sport of hockey and the summer camp experience more accessible to disadvantaged youth. Over the past five seasons, 50/50 has raised over $6,915,000 for the True North Youth Foundation’s three programs: The Winnipeg Jets Hockey Academy, Camp Manitou, and Project 11. 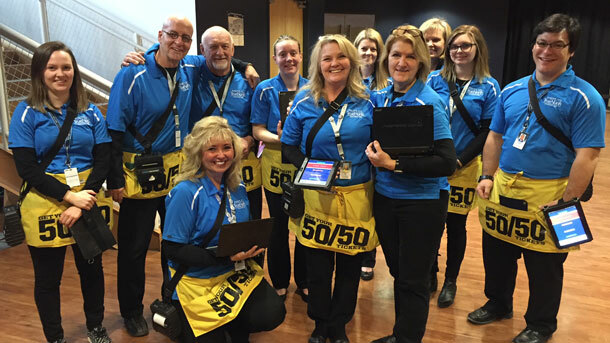 True North Youth Foundation announces new upgrade to its 50/50 program. The format of the raffle draw will be a standard 50/50 format, whereby half of the gross revenue from 50/50 sales for each Manitoba Moose and Winnipeg Jets home game will be given as a prize at the game. Online sales will be open for Winnipeg Jets home and away games with the same 50/50 format. Tickets sold through our Bump 50:50 electronic system are 3 for $10 or 10 for $20 or 50 for $50 or 100 for $80. Ticket buyers receive their printed or online ticket listing their numbers. The corresponding individual numbers are stored electronically. Ticket sales are at all Manitoba Moose and Winnipeg Jets hockey games and Winnipeg Jets viewing parties at the Bell MTS Place, as well as online sales Jets away games. Tickets for home games are sold from the time the doors open until the halfway point of the 3rd period. Online tickets sold for away games will open 4 hours prior to game time until the end of the game. Tickets sales for viewing parties in the Bell MTS Place will be sold from the time the doors open until the halfway point of the 3rd period. After the 3rd period for all Winnipeg Jets or Manitoba Moose home games. The winner goes to Guest Services on the Main Concourse to hand in their winning ticket. The ticket must be validated by the True North Youth Foundation. Any ticket is void if it is unissued, altered, counterfeited, forged or produced in error, or which is any material manner illegible, mutilated, defective, misprinted or otherwise incomplete or if it fails to meet the True North Youth Foundation’s validation tests. The winner will then fill out a 50/50 Payout Form to receive their prize after ten business days from the True North Sports + Entertainment Accounting Department. Away game winning numbers will be posted on http://wjets.bump5050.com/ following the draw. The winning cheque will be sent to the winner with the customer details provided at time of purchase. Prize is paid by cheque and will be mailed within 10 business days of the winner claiming the prize. Winners have 30 days to claim their prize. Unclaimed prizes will revert back to the True North Youth Foundation. In-arena sales: In the event that the electronic 50/50 system goes down for any circumstances, the True North Youth Foundation will have paper tickets to sell. The format will be one ticket for $5 and will be numbered in sequential order. The paper tickets will only be in place prior to any electronic tickets purchased, if the electronic system goes down anytime during the game the draw will be made in the 3rd period with only the purchased tickets from the electronic system. Should a Manitoba Moose home game and Winnipeg Jets Road game occur at the same time, the pots will be combined into one draw. The following individuals are not eligible to participate in the 50/50 raffle at Manitoba Moose and Winnipeg Jets’ home games: 50/50 staff who are working a specific game. Winning numbers and amounts are also available on the Foundation website at www.winnipegjets.com/fiftyfifty or www.moosehockey.com/fiftyfifty or by calling the 50/50 hotline number at 204-926-5696. All tickets will be stored electronically for one year after the draw. Thank you to all our fans for supporting the True North Youth Foundation 50/50 Ticket Program.